Pulse flour and butter in a food processor until butter is pea-sized. Transfer to a large bowl; stir in corn and 1 cup Cheddar. Add cream; stir until just combined. Dust hands with flour and knead dough five or six times in the bowl. Transfer dough to a lightly floured work surface and pat with floured hands into an 8-inch square. Cut into 16 squares. Place on lined sheet; sprinkle with remaining 1/4 cup Cheddar. Bake until golden brown on top, 18 to 20 minutes. Serve hot or at room temperature. Store any leftovers in an airtight container in the refrigerator for up to 2 days. To grill corn (preferably over charcoal for best flavor), leave the husk on and grill it first until charred. Then remove the husk and strings and put it back on the grill for a little color – 2-3 minutes – rolling to heat all sides. 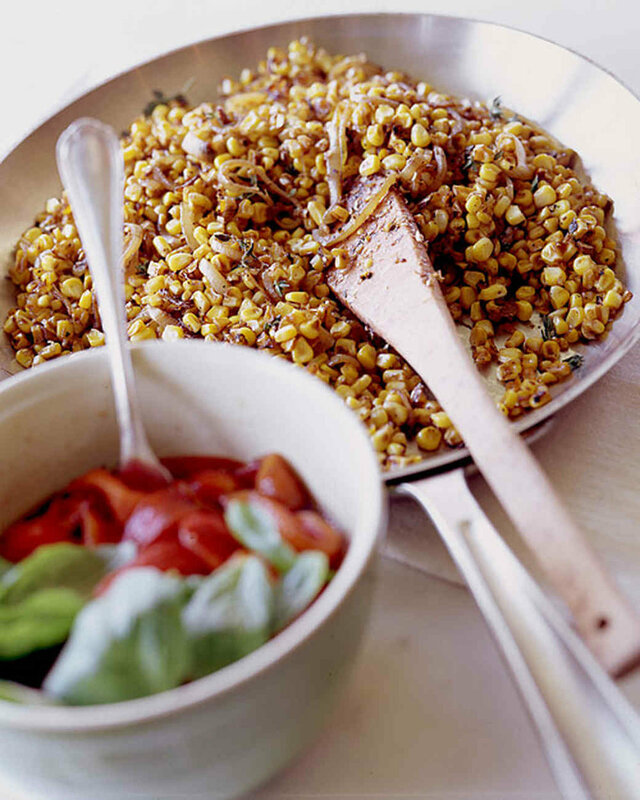 Once grilled, slice corn off of the cob and add to bowl with remaining ingredients and stir. Taste and adjust seasonings as needed, adding more salt, pepper, or lime juice for added flavor. Serve immediately. Will keep covered in the fridge for several days, but is best when fresh. Heat a grill to medium. 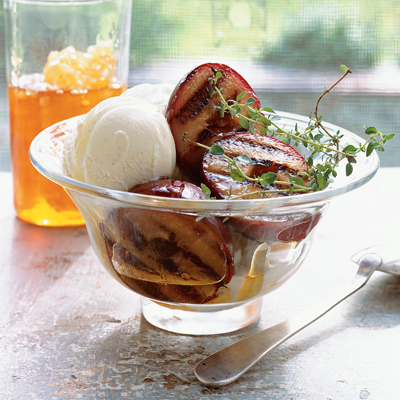 Toss plums and 2 tablespoons honey in a large bowl. Liberally brush a grill rack with oil. Grill the plums, flesh side down, on the rack until lightly browned -- about 3 minutes. Turn and grill on skin side until plums soften and are warmed through -- 2 to 3 more minutes. Serve 2 plum halves with 3/4 cup yogurt immediately. 1. Cut the tomatoes into small cubes, roughly slice the red onions. 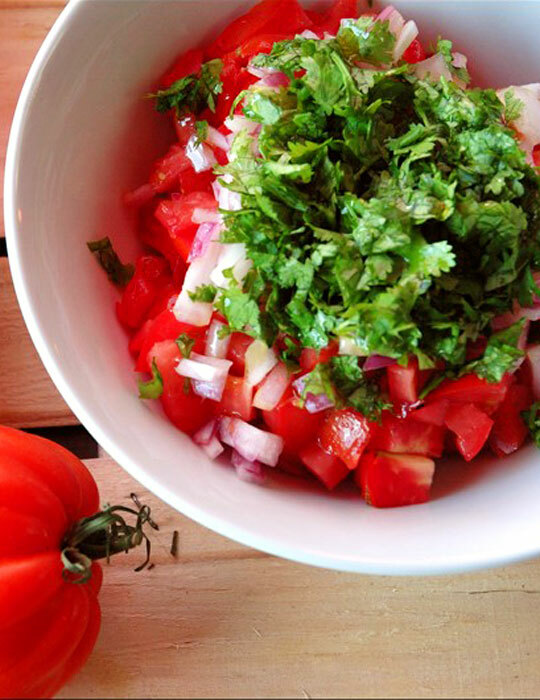 Wash fresh cilantro and chop with a knife. 2. In a bowl, prepare the dressing by first dissolving salt into lemon juice. mix with olive oil, add salt and ground pepper. 3. Place in the refrigerator for at least 30 minutes, time to allow the flavors to blend and tomatoes make some juice (which shouldn’t drown the salad if they are from good quality). In a large skillet over medium heat, melt the butter. Add the corn, shallots, sugar, and salt and pepper. Cook, stirring occasionally to prevent burning, until the corn is caramelized, about 5 minutes. Stir in the thyme and cook 5 minutes more. Season with salt and pepper.